In my perpetual quest for the unexpected, this time I ended up in beautifully surreal Abyaneh, in central Iran, about 300km away from Tehran, in Esfahan province. Anyone who enjoys traveling off the beaten path, will find this ancient village paradise on earth. 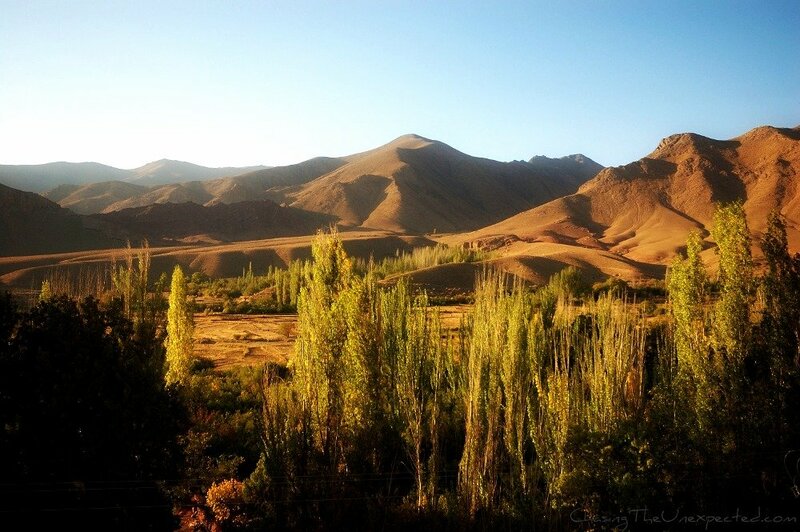 We arrived in Abyaneh late afternoon, after driving all along the unbearably fascinating mountain range that seemed to be Iran’s natural spine. Once at the destination, we went straight to our hotel, decorated in an exquisitely traditional style, and after quickly collecting ourselves we met up again in the dining hall, where we were given the possibility to choose between normal tables and large, yet cozy, sofas on which locals both dine and relax after the meal. For dinner we had “Dizi”, a traditional Iranian sheep-based dish served in a bowl in which every guest was meant to smash their own piece of sheep fat and add the crashed bread and the sauce enriched by smashed veggies and the meat in pieces. The view from our room was a proper treat: a chain of unspoilt red mountains that dominated the ancient village, entirely made with red clay. From our hotel we could only see a tiny glimpse of the hamlet, and the daylight fading away was making it all the more shrouded in mystery, increasing the already very enticing effect it was having on me. The further I step back in time when visiting new places, the more my passion for history gets a new sparkle, and in Abyaneh we did step back some 2,000 years. 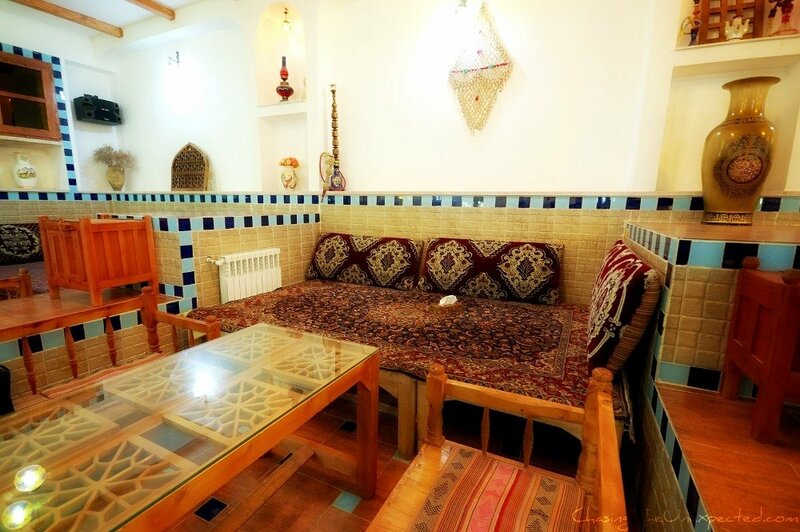 Set at the foot of the Karkass mountains, Abyaneh is the best place to experience the Persian Empire. 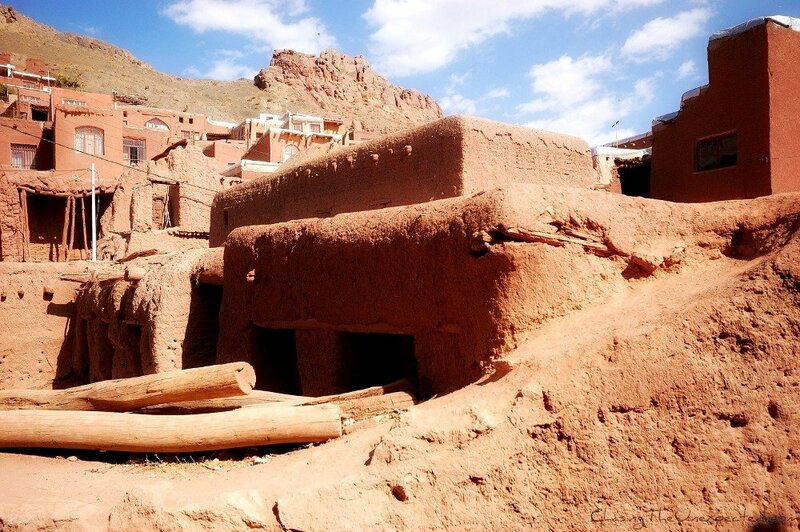 From its architectural style, entirely in red clay, to the proudly preserved oldest traditions, the village is what best blends a close contact with nature and erstwhile Iran. Abyaneh is the kind of place where the boundaries between time and space are blurry, in case you were wondering if such places really existed. The town’s layout is irregular and labyrinthine, the buildings of undefined frames, the color strictly red. Natives are very jealous of their traditions and are not willing to sacrifice them in the name of any modern blasphemy, be it tourism or globalization. Women proudly boast their colorful, flowery hijab, typical of their costume, almost as an outlandish reaction to the traditional simplicity of the surroundings. Apart from the old houses, Abyaneh offers to tourists also a fascinating Zoroastrian fire temple dating back to the Sassanian period, castles, a pilgrimage site and eight mosques, three of which (Hajatgah, Porzaleh and Jam’e) certainly worth a stop. The tangle of narrow alleys makes it very easy to get lost, and I would certainly have (and probably liked to) if I weren’t with locals. The ancient red houses strung out along the ragged main and side streets give the impression you are motioning towards a different era, when cars didn’t exist, when men had a little more respect for the planet than they have now, when the local community was vital for everyone’s life. It felt like I was motioning to some otherworldly experience. “You are always the last one”, my guide never missed to point out to me. True, I was, maybe in some kind of unconscious attempts to make the visit last longer and further delay our trip back to reality. Wow I’ve never heard of Abyaneh but it looks incredible. There’s a lot of history in Iran, it must be such an interesting place. Lovely photos. 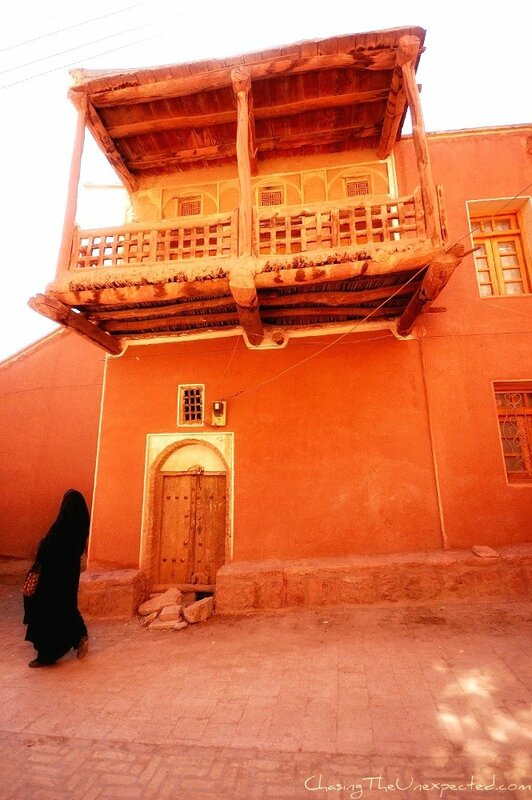 It’s such a fascinating country, Abyaneh feels really like stepping back in time, it’s fantastic, if you are around I recommend a stop in Iran..
Tu nous avais tout raconté, mais lire l’article et voir les photos c’est vraiment un plus : c’est magnifique et on ira en Iran! Che bel posto,e interessante!Non ne avevo mai sentito parlare ed è un peccato perchè merita di essere visto!Se è cosi suggestivo in fotografia,chissà le emozioni vederlo nella realtà! beautiful imagery, and what a discovery, thanks! Thanks Graham, glad you like it :) Beautiful place indeed! Iran looks magical! I am dying to see that part of the world. Turkey blew my mind — I have so much travel to do! 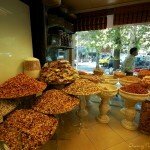 Iran is absolutely worth a trip, and Abyaneh is a must-see! Wow, when I think of Iran, this is certainly not what I think of. Fascinating post, and beautiful photos! Yes Emily, is really worth of seeing, especially my village, Abyaneh. You are invited to come and see. Vow! these r really interesting! Did u take these pictures yourself? Lovely piece about a fascinating country. Hope you’ll write more about Iran. Absolutely fascinating. I too, have never heard of Abyaneh. But I took note… and as always, very well written. Thanks Fida, my visit was way too short, next time I’ll stay for a couple of weeks to be able to actually experience their traditional lifestyle. Amazing how much the top picture looks like a Southwestern Indian pueblo, and the bread looks like a folded tortilla! Their bread is very similar to the traditional bread we have in Sardinia, all their flavors are actually very close to ours, it’s amazing how many similarities we found traveling the world over! 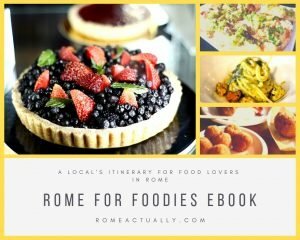 Lovely post – thanks for opening my eyes to this place. Absolutely worth a trip, I’m sorry I didn’t stay long enough to soak up in their culture, they are very proud of their most ancient traditions, I would have loved to stay more in contact with locals like I did in India, and maybe attend one of their festivals. I hope there will be a next time. It’s my pleasure, that you had a good moments in my country. You know what, Iranian people wants to other countries people come to Iran and see the truth by their self’s not by unfair media! Iranian people believed that their country is a most beautiful country around the world, you can see four seasons in Iran, by a little traveling!! Iran welcomes you with open arms and a warm hug. Wow. Incredible photos. Iran isn’t a place that I had really considered visiting, but that seems like a pretty big oversight on my part. I don’t know when we’ll get there, but it’s definitely on the list now. Thanks. Hi Brian, thanks for your comment. To be honest, I had been thinking about going to Iran for some time, but never made the decision. Now I was invited to a conference and took advantage, mainly just to break the ice. And glad I did, certainly now I’m more confident traveling to Iran again. I was in Iran recently and visited Abyaneh too. It’s a place like no other, wish I could have stayed longer than you did. Looks like there’s a lot more things to see/do there than I thought! Loved Abyaneh too, I too wished I had stayed longer, I told my friends next time I’d like two spend two full weeks there in order to soak up in their culture. I can’t believe that after all our years living in the UAE, we still haven’t been able to get across the water to Iran. Every time we’ve had a trip scheduled there’s been some event that’s forced us to cancel. After seeing these stunning pictures of yours I’m determined to go next year. My new year’s resolution. i think it is a very interesting place. it is so simple, yet very attractive. the culture and the authenticity of the place are the top reasons for someone to visit that place. i guess i will get lost there too. the buildings all have the same colors. I am really thankful to visit my country, and speacialy my village, Abyaneh. I am grateful that you have introduced it to other people. Dear Mahmoud, thanks so much for your comment. 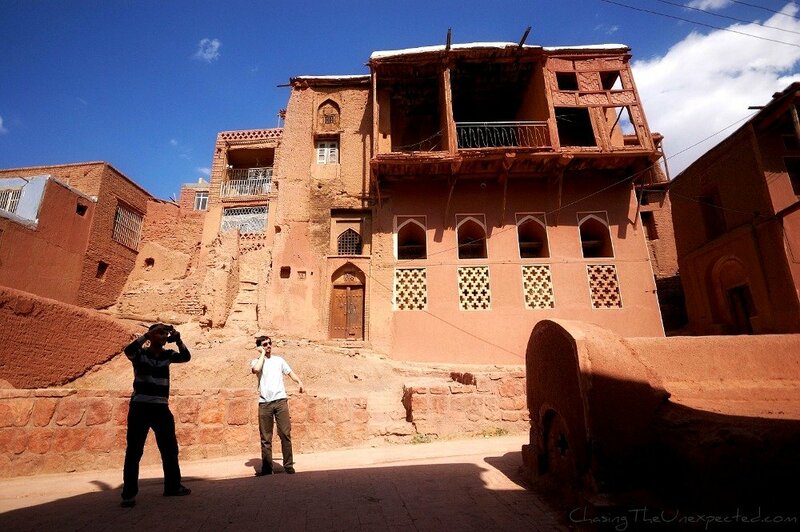 I was truly enchanted by Abyaneh and I hope I’ll manage to go again. can i ask, where do you come from? when i can ask? I come from Italy, and I came to Iran last October. You are very welcome in Italy! Next time you come to Abyaneh, You are my guest to know abyaneh better. If you be in Abyaneh with one of viunj(the people of abyaneh)then you find a new window to the history of IRAN. Also you could find many people of Abyaneh in FACEBOOK. it’S enough to search “ABYANEH”. I invite you to my page.